I've been receiving a lot of messages and reading on the lists that folks would like to know how they can share their good wishes with Lucy and Rob on the upcoming birth of their child. 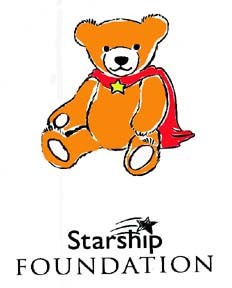 Lucy has long been a supporter of Starship Children's Hospital in New Zealand and they recently started a campaign to raise funds to develop a nationwide "telemedicine" network. At a news conference, Lucy stated that, "Fortunately, I live close enough where getting access to excellent care is not a huge problem." She said that this network would allow children in remote areas of New Zealand to be able to participate in the hospital's services. Lucy handed out Starbears to help raise the money. If you send the Official Xena Fan Club a postcard listing your name and donation, we'll keep track of the amount raised and let everyone know how we're doing in the next issue of the newsletter and on the fan club web page. P.P.S. Online folks can send emails instead of postcards.